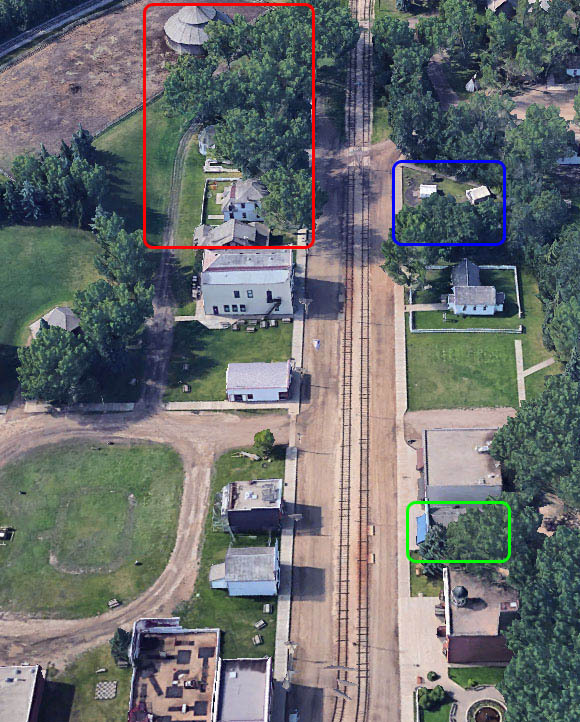 The 1905 Street overview, on how to utilize Fort Edmonton Park to survive Deadmonton's zombie apocalypse, is now up. There are some great spots here to consider, such as the Fire Hall / Town Hall building. With its all brick exterior, reinforced doors, living quarters upstairs with wood burning stoves for heat and cooking, you should seriously consider staying here during the zombie apocalypse. The roof-top look out is also a great bonus; know what's moving around you and plan your defenses. However, as it is now, the Fort Edmonton Park 1905 overview is not complete. Some important buildings had to be left off: Firkins House, Rutherford House, Henderson Farm and round barn (red section in picture below), Tent City (blue section in picture), Ernest Brown Photography (green section in picture), and more. These had to be left off due to the limitations of the tablet layout. For some reason, I am unable to fit more into that format. I have figured out a work around, but it will take a little bit to get this coded and implemented. Once done, I will then add the remainder of the buildings not currently listed. This will also be the case with 1920 street, where several buildings are also missing from the overview. For now, check out what is available on the street and how it could help you survive. There is also a spot, at the bottom of the 1905 Street page to leave comments, feel free to do so and let me know what you think.